Pink, blue and violet crocus blossoms flourish on a luxurious white wool shawl by Sajad. Created with fine machine embroidery, the motifs emulate India's traditional aari work, a kind of chain stitch. Luscious fringe trims each end. 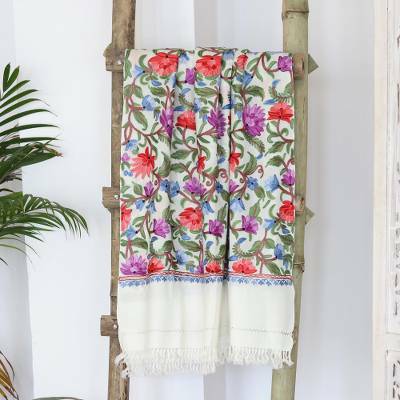 You can find wool shawl 'Early Crocus' by Sajad in accessories categories such as Floral Shawls, Leaf and Tree Shawls, Embellished Shawls and Wool Shawls. Enjoy exploring these sections for other Novica treasures.